In this DVD you will learn advanced moves and combinations, which you can use in any style of Blues dancing. This video covers over eight dynamic movements with a focus on connection and fluidity of movement. 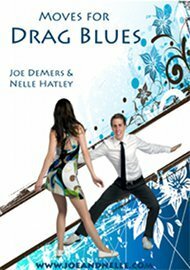 Drag Blues is modern variation of Slow Drag and Ballrooming from the early 1900’s, both of which are vintage Blues dances. This style of Blues dancing has a more defined technique and incorporates a lot of Swing dance movements. Joe Demers and Nelle Hatley are known for being very versatile dancers ranging from Jazz, Vintage Blues to performance Lindy Hop. They pride themselves with basing their dance on original Blues styles while continually striving for new ideas.